Another fantastic week with Loreto painting in France. This year we were in the beautiful chateau de Brussons, an authentic French secluded chateau on beautiful grounds where we were blessed with options to paint whichever way we turned. This year we had the added bonus of yoga each morning with Marie. We stretched and meditated and with Marie’s encouragement, we grew to love and enjoy the morning yoga. This was so (early!!) relaxing and set the tone for the day. Food was excellent, as usual and the wine flowed and sing songs and laughs with this lovely group made the experience very relaxed and enjoyable. Loreto’s expertise and gentle tutoring coaxed us along ensuring we grew in confidence and learned to experiment and put our new learning into practice, The culmination of this was our Exhibition on our final evening. We celebrated with champagne with Veronique and her husband, owners of the chateau, who were affirming and appreciative of our weeks work all based on the chateau de Brussons. I now equipped myself with the basic paint colours, brushes and boards and have the confidence to go forth and paint! Many thanks Loreto and Marie! I’ve just returned to England following a week in France! Loreto’s course was splendid and as a novice ‘artist’ I learnt so much in 7 days. She is an encouraging, enthusiastic teacher who offers positive advice yet with suggestions of how I might improve my work. Nothing was too much for her and I never felt belittled or dismissed as a non-painter. Marie with her yoga was an inspiration too. The morning sessions set the pace of the day and allowed me to feel relaxed yet invigorated. A truly memorable week – for many reasons! Thank you Loreto , for a wonderful week in the amazing chateau de Brussons, loved every minute, especially the painting in the very inspiring surroundings of the chateau, amazing food and of course all the great wines. Marie’s yoga each morning was so good, especially after the late nights. Thank you again for all your encouraging words and patience. Looking forward to going back once again in 2018. I have just returned from a wonderful week painting with Loreto in the lovely sunny Loire Valley in France. As a beginner I was encouraged by both Loreto and the rest of the class, she is an excellent teacher and was always available for support. All good quality materials were provided and we were introduced to various locations and landscapes which catered for students of all levels. The group comprised of many nationalities, abilities and friendly people who all shared a love of painting , good food, local wine and a sense of fun . I would thoroughly recommend this type of holiday to my friends and I am looking forward to going again next year, to Provence. 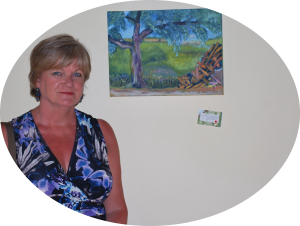 Thank you Loretta and Marie for painting and yoga in chateau de Brussons. Lovely meals and wines. Trips to Le Mans and Tours. Going to France with Loretta and Marie for many years each year brings new things. Looking forward to 2018 in Provence. Thrilled to have another opportunity to paint in south of France! I’ve thoroughly enjoyed the previous painting holidays in Italy and last year in France and am delighted with and proud of the work I took home! Can you book me in on Course 3 please. I am looking forward to it already! Art du Midi offers a fantastic opportunity for aspiring artists of all ages to be inspired by the picturesque French countryside and embrace their inner impressionist by experiencing painting “en plein air”. The course takes place in the unspoiled village of Quarante which offers modern conveniences such as friendly bars and cafes while maintaining a rustic charm. The course is residential, and all meals and art materials are provided which allows the student plenty of time to relax but also to focus on their art and enjoy the expert tuition and encouragement offered by Loreto. The local wine and fresh bread is a particular pleasure as is the beautiful scenery. The opportunity to avail of a day trip to the beautiful beach in Collioure was also welcomed by the group but there are plenty of other nearby attractions that I hope to experience on a return visit. 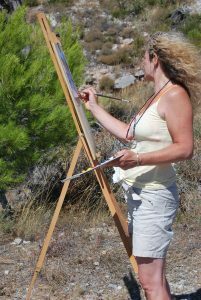 The Art du Midi course is a relaxing and holistic experience that offers the chance to develop one’s artistic ability in a supportive environment with no shortage of stunning landscapes to provide inspiration. I would thoroughly recommend the course. Starting with the friendly welcome at Carcassonne airport, the entire week in France was a thoroughly enjoyable and rewarding experience. Not only did I learn more about painting than on any other course I have done, but the warm sunshine, the feeling of being at home in Loreto’s lovely house, the delicious food, the stimulating conversations over a glass of local wine, and the charming surroundings of this authentic French village set in the vineyards of Languedoc combined to make this the best holiday I ever had. I have just returned from a wonderful week painting with Loreto in the lovely sunny Loire Valley in France. As a beginner I was encouraged by both Loreto and the rest of the class, she is an excellent teacher and was always available for support. All good quality materials were provided and we were introduced to various locations and landscapes which catered for students of all levels. The group comprised of many nationalities, abilities and friendly people who all shared a love of painting , good food, local wine and a sense of fun . I would thoroughly recommend this type of holiday to my friends and I am looking forward to going again next year. Another fantastic week with Loreto painting in France. This year we were in the beautiful chateau de Brussons, an authentic French chateau secluded on beautiful grounds where we were blessed with options to paint whichever way we turned. This year we had the added bonus of yoga each morning with Marie. We stretched and mediated and with Marie’s encouragement, we grew Ito love and enjoy the morning yoga.This was so (early!!) relaxing and set the tone for the day. Food was excellent, as usual and the wine flowed and sing songs and laughs with this lovely group made the experience very relaxed and enjoyable. Many thanks Loreto and Marie.